When taxiing at an airport without a full-blown airport diagram (most commonly, a non-towered airport), how does a pilot know whether taxiway A (Alpha) is on one end of a runway, or the other? Or, in the case of taxiway exits, how does one know whether exit A1 is at one end of a runway, or the other? In other words, are taxiways numbered in a predictable or consistent way? 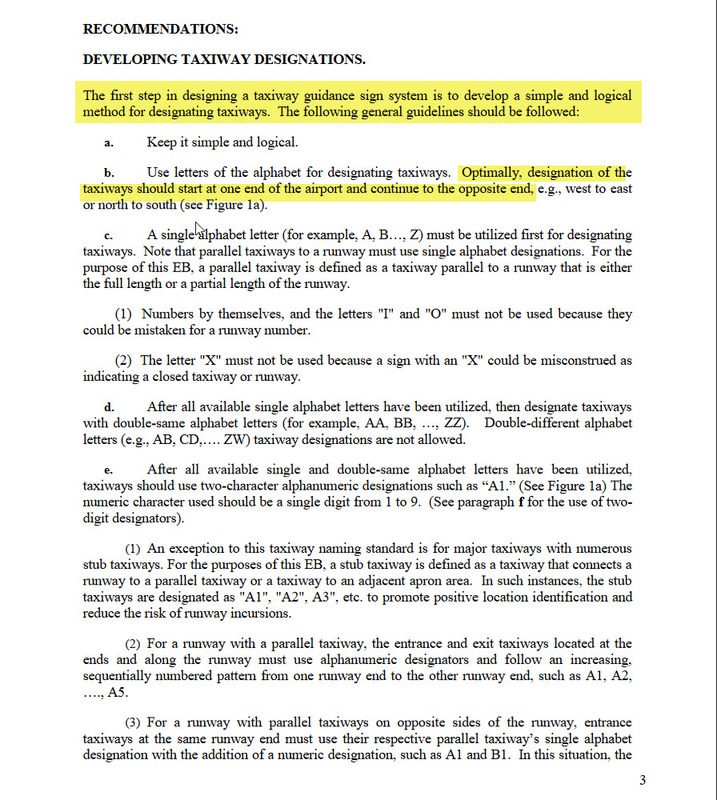 An example would be, “Exit A1 is always located at the easternmost exitway of Alpha”. If they are, is this because of custom or regulation? Not at all - they'll be built-up in a logical fashion in so much as they're not just randomly assigned but there's no standard beyond the use of letters to denote taxiways and numbers to denote holds. Each airport is free to "make up" it's pattern of taxiways and exits as it sees fit, and many will evolve and grow over time. For example, at Birmingham International taxiway A (Alpha) takes you from the runway to an intersection with T (Tango) and D (Delta). Bravo is a small spur between the runway and Alpha and there is no Charlie. At the other end of the runway is Echo and Sierra. At London Gatwick, Alpha isn't even used on 26/08 - rather it's Juliet, Quebec Hotel and Golf. And neither runway has Echo or Sierra. In short, there's no substitute for simply knowing (Through the use of chart or local knowledge), looking for signs for asking for a progressive taxi where the controller gives you step by step instructions. Also, note the general taxiway numbering/nomenclature schema for Los Angeles International Airport (KLAX) illustrated on the bottom of this page. The letter "A" starts the taxiway nomenclature beginning on the south side of the airport and progresses alphabetically towards the northside of the airport. Intersecting taxiways are numbered sequentially. Airport taxiway nomenclature can be very complex depending on the airport. Also, as modifications are made to the ramps and movement areas, etc., effectively designating taxi routes or other areas of the airport becomes challenging. 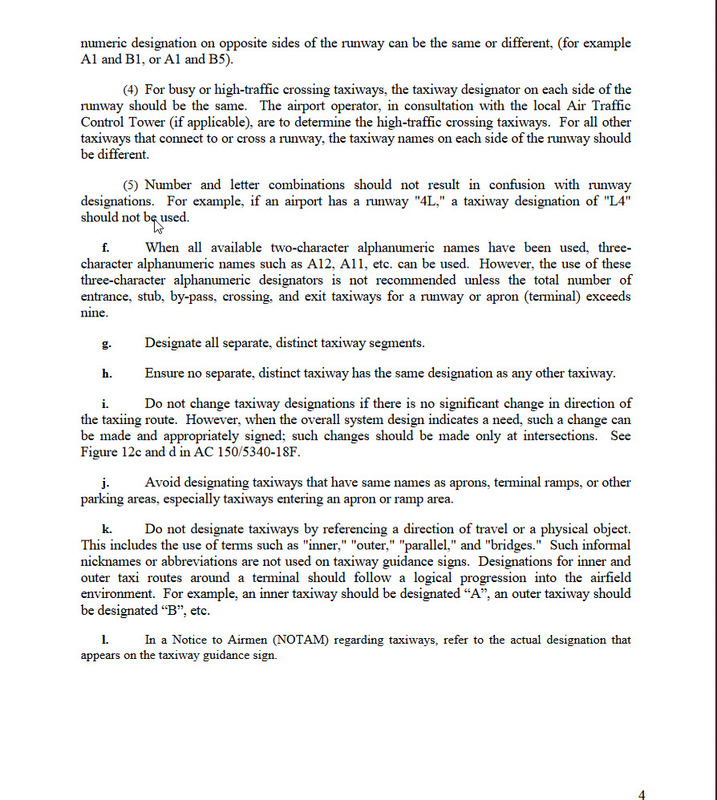 Finally, in the U.S., there is a taxiway numbering/nomenclature methodology that is framed within FAA guidance documents. A close comparison of the design guidance with current airport layouts and taxiway numbering/nomenclature not only illustrates the complexity involved but also reveals, in most cases, a consistency that can be relied upon and proves to be extremely useful in actual practice. Not the answer you're looking for? Browse other questions tagged runways taxiing airport-design airport-markings non-towered-airport or ask your own question. 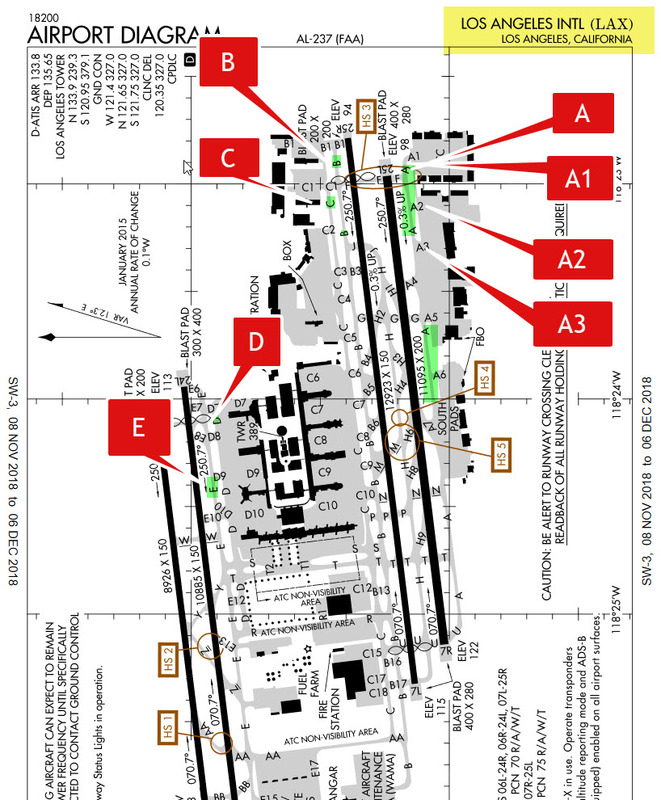 What are the areas marked in green around the taxiways? NOTAM - What means “no shoulders along taxiways” in German?